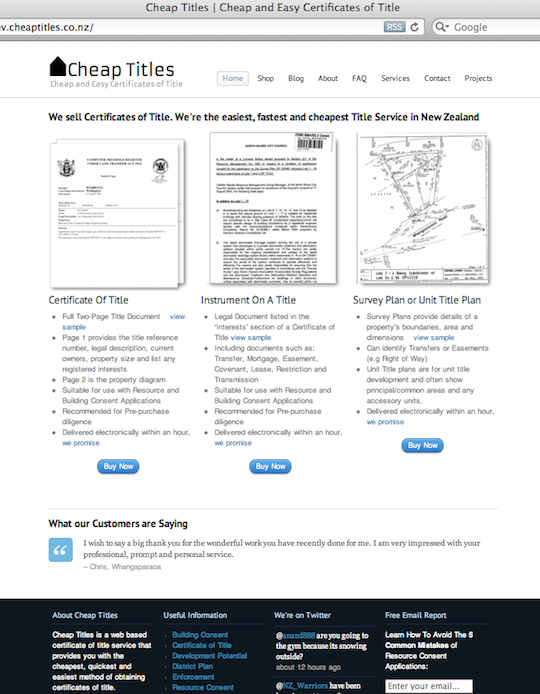 To purchase any product from Cheap Titles just follow the steps outlined below (these steps will principally demonstrate how you can purchase a Certificate of Title with Diagram – but additional notes have been provided as a guide for purchasing the other Cheap Title products that are available). 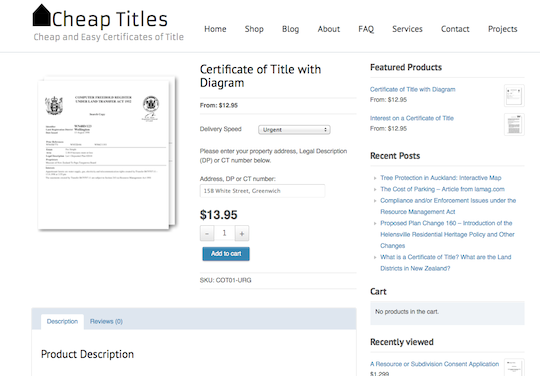 Step 1: Go to http://www.cheaptitles.co.nz/. 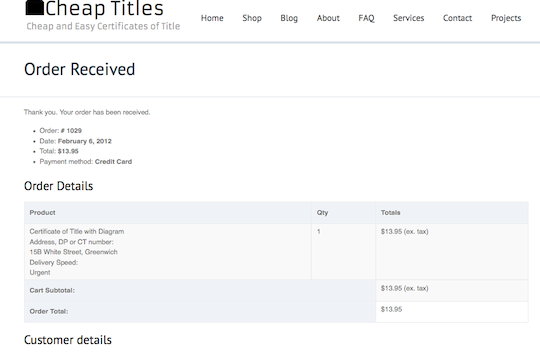 Step 2: To purchase a Certificate of Title, click on the blue “Buy Now” button underneath the Certificate of Title product. (Note: If you would like a different product, click SHOP on the menu (at the top of the page). This will take you to a page that illustrates all the products that are available to purchase. Click on the blue “Buy Now” or “Add to Cart” buttons to select your chosen product. Step 3: Select your delivery speed. Urgent products will be delivered to your email address within the hour (during operating hours). Overnight products will be delivered to your email address by 10am the following working day. Step 4: Enter your property details. It is helpful to include the suburb and city or region, for example you might enter 15B White Street, Greenwich. If you do not have or know the property address the next best options are entering either the Legal Description which may look like Lot 56 DP 123456 or the CT number or Title Identifier which will look like NA12C/34 or SA56D/78 or another reference number such as 123456. If we are not able to locate the title in the system for the description that you have provided, we will give you a call or send you an email to obtain further information or to clarify the details you have provided. Step 5: If there is more than one title for the property, increase the quantity of products ordered (from the default of 1) by using the “plus” button. If there is just one title for the property, proceed to the next step. 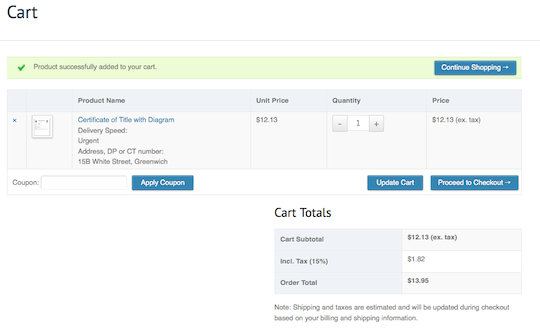 Step 8: If your order is now correct click the blue “Proceed to Checkout” button. If your order is not correct add or delete titles/products until you are happy with the contents of your order and “Proceed to Checkout“. Step 9: Enter your contact details (this must include a correct email address for the title to be sent to). It is not compulsory to enter a Company Name. Step 10: Check your order details. Select your payment method. You can chose Credit Card (via Paypal), Direct Bank Transfer or Monthly Invoice. Please note that the monthly invoice option is available to approved account holders only. Also, products ordered and paid for via Direct Bank Transfer will not be emailed to you until your payment has been processed. Click the blue “Place Order” button. Step 12: Complete your purchase either by logging into your Paypal account (if you already have one) or by clicking the “Don’t have a Paypal Account?” link to pay by credit card. Step 13: If you don’t already have a Paypal account, once you have clicked on the “Don’t have a Paypal Account?” button you will need to fill in your credit card details and some personal details. Please note: although Paypal requests a shipping address your requested titles(s) will be sent to your nominated email address. 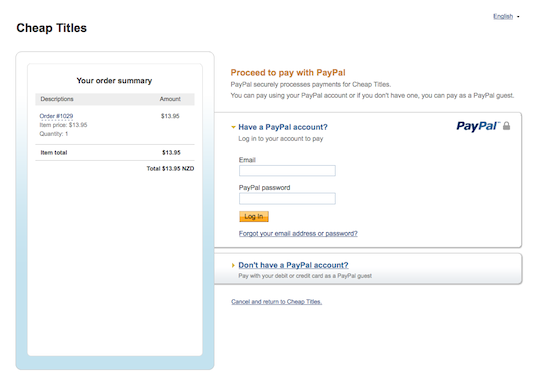 Step 14: Once you have competed filling in your details click on the yellow “Pay Now” button. You will be redirected back to Cheap Titles to a page entitled Order Received. Step 15: (Direct Bank Transfer) Once you have clicked the blue “Place Order” button you will be directed to a page entitled “Order Received“. 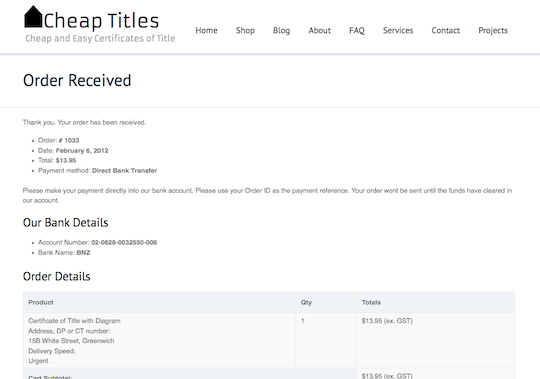 The bank account details are provided for you to transfer the required titles fees to – see “Our Bank Details“. Please transfer the required fees and we will deliver the requested title(s) to you as soon as payment is received.